Being able to calculate a complete gas turbine engine (i.e. all the components, from compressor to turbine, with a 360° configuration) is the next step in the computation of turbines flows. 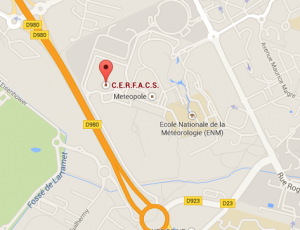 At the beginning of the 2010s, it has been the challenge initiated by CERFACS with its partners. The computation of the elements of a gas turbine can not be performed in a modular way anymore for certain problems: the simulation must couple all elements. For example the turbine entry conditions and the combustion chamber outlet must be connected. 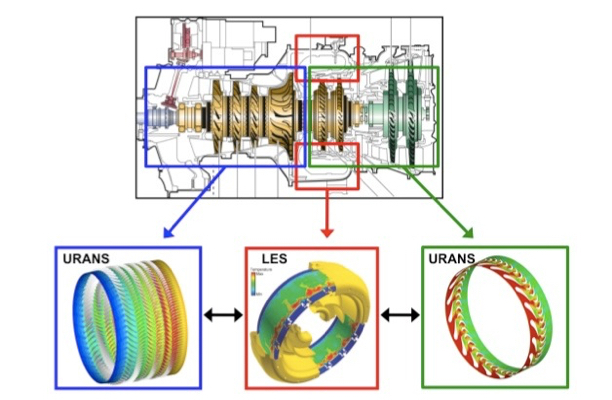 Optimizing a turbine will request a coupled computing of all its elements. In fact, the same argument applies to the whole engine and the manufacturers know that today the coupling of their simulation tools has become an essential point. Within COUGAR, CERFACS coordinates research on the combustion's simulations in the chamber, flow in the compressor and turbine, and the coupling methods between all these elements on massively parallel computers. The COUGAR challenge at CERFACS is supported by multiple European and national projects as well as by bilateral contracts with CERFACS shareholders. The aim is to realize unsteady computations of the whole machine (compressor / chamber / turbine) or at least of two of its components (chamber / turbine or compressor / chamber). This aim is far ahead of the present simulation techniques and requests significant resources. CERFACS is associated with ONERA regarding the coupling method development (through an Opensource code called OpenPalm (https://cerfacs.fr/coupleurs-developpes-au-cerfacs/) allowing to couple many simulation codes inside the combustion chamber and in its surrounding elements. The COUGAR challenge is supported by European contracts as well as national and regional contracts and also by the CERFACS's sharehoders. Complete unsteady simulation of a gas turbine requesting coupling of the compressor, combustion chamber and turbine calculations on high performance parallel computing.